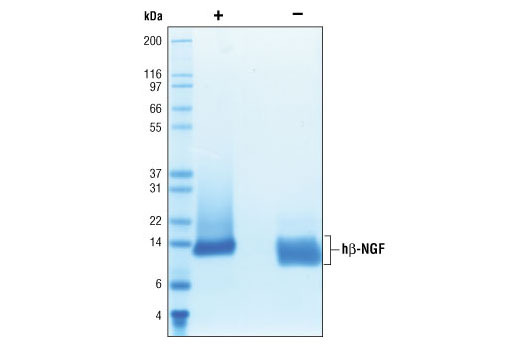 The purity of recombinant hβ-NGF was determined by SDS-PAGE of 6 µg reduced (+) and non-reduced (-) recombinant hβ-NGF and staining overnight with Coomassie Blue. The proliferation of TF-1 cells treated with increasing concentrations of hβ-NGF was assessed. After 48 hour treatment with hβ-NGF, cells were incubated with a tetrazolium salt and the OD450-OD650 was determined. 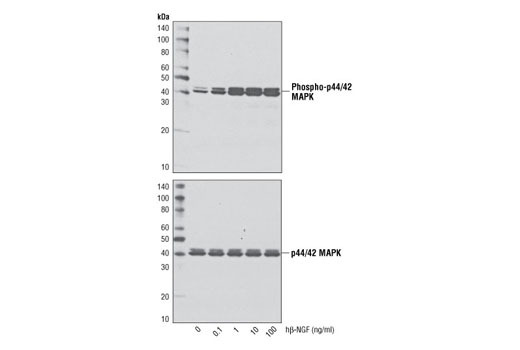 Western blot analysis of extracts from TF-1 cells untreated or treated with hβ-NGF for 10 minutes, using Phospho-p44/42 MAPK (Erk1/2) (Thr202/Tyr204) (D13.14.4E) XP® Rabbit mAb #4370 (upper) and p44/42 MAPK (Erk1/2) (137F5) Rabbit mAb #4695 (lower). Recombinant human β-NGF (hβ-NGF) Ser122-Ala241 (Accession #NP_002497) was expressed in human 293 cells at Cell Signaling Technology. >98% as determined by SDS-PAGE of 6 μg reduced (+) and non-reduced (-) recombinant hβ-NGF. All lots are greater than 98% pure. Based on amino acid sequencing, greater than 85% of recombinant hβ-NGF starts at Ser122 (SSSHP) and has a calculated MW of 13,494. The remainder starts at Ser124 (SHPIF). DTT-reduced and non-reduced protein migrate as 13 kDa non-disulfide linked homodimers. 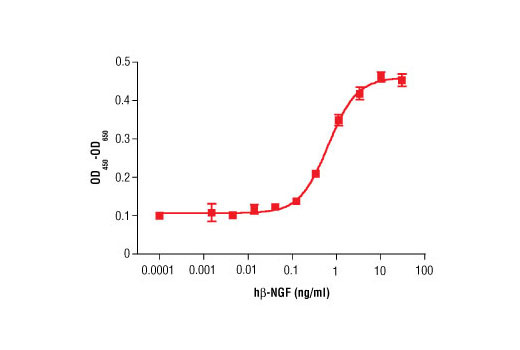 The bioactivity of recombinant hβ-NGF was determined in a TF-1 cell proliferation assay. The ED50 of each lot is between 0.5-1.5 ng/ml. Less than 0.01 ng endotoxin/1 μg hβ-NGF. With carrier: Lyophilized from a 0.22 μm filtered solution of PBS, pH 7.2 containing 20 μg BSA per 1 μg hβ-NGF. Carrier free: Lyophilized from a 0.22 μm filtered solution of PBS, pH 7.2.
β-NGF is the prototypical member of the neurotrophin family of growth factors (1). β-NGF is involved in neuronal survival, differentiation and growth (1,2). Outside of the nervous system, NGF is produced by a variety of immune cells, including B cells, T cells, monocytes and mast cells (3,4). β-NGF binds to and signals through two distinct receptors, TrkA and p75NTR (1,2). Cellular responses induced by NGF are modulated by receptor expression. For example, TrKA leads to the inhibition of apoptosis and neuronal differentiation. In contrast, signaling through p75NTR in the absence of TrkA induces cell death. (1,2). NGF signaling via TrkA is characterized by activation of the PI3K/AKT and PLCγ pathways (1,2). NGF signaling via p75NTR induces JNK and NFκB activation (1,2). Aberrant NGF signaling may be linked to the onset of Alzheimer’s disease (5,6). Bibel, M. and Barde, Y.A. (2000) Genes Dev 14, 2919-37. Frossard, N. et al. (2004) Eur J Pharmacol 500, 453-65. Jiang, Y. et al. (2007) J Immunol 179, 6297-304. Matrone, C. et al. (2009) Proc Natl Acad Sci USA 106, 11358-63. Matrone, C. et al. (2008) Proc Natl Acad Sci USA 105, 13139-44. Huang, E.J. and Reichardt, L.F. (2003) Annu. Rev. Biochem. 72, 609-642. Lai, A.Y. et al. (2014) J Biol Chem 289, 3666-76. Rochman, M. et al. (2015) Mucosal Immunol 8, 785-98.